Is “grammatical diversity” a useful concept? 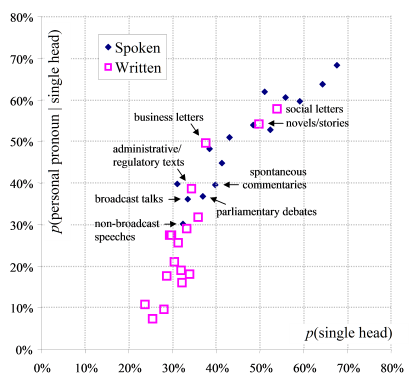 the probability that single-word heads were a personal pronoun, p(personal pronoun | single head). Note that these two variables are independent because they do not compete, unlike, say, the probability that a single-word NP consists of a noun, vs. the probability that it is a pronoun. The scattergraph below illustrates the distribution and correlation clearly. Scattergraph of text genres in ICE-GB; distributed (horizontally) by the proportion of all noun phrases consisting of a single word and (vertically) by the proportion of those single-word NPs that are personal pronouns; spoken and written, with selected outliers identified.